November 21, 1999 Marion New York - The latest formation on record, at least in soybeans, formed around October 21st when it was discovered in Marion, New York about 30 miles east of Rochester near Lake Ontario. The farmer was havesting at night with spotlights and was shocked to discover the curves, circles and corridors of this new pictogram in exactly the same place he found another formation in mid-August 1997. 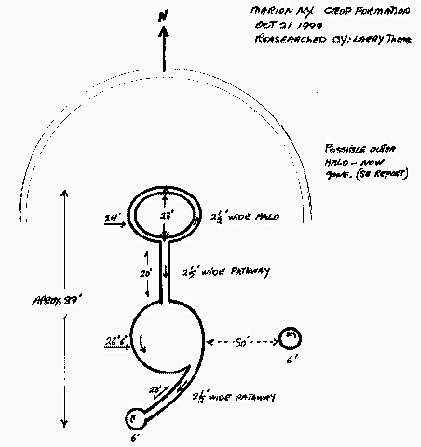 This new one was lined up north to south with a 24-foot-diameter ring at the top connected by a long corridor to a large comma-shape. Fifty feet straight east of the comma was a small 6 foot circle, known as a "grape shot." The entire formation was apparently crowned by a thin arc which the farmer had nearly obliterated in his night time harvesting before he realized the pictogram was there. All the circle, ring and arc plants were laid down counter-clockwise, except for one small circle at the end of the comma which was clockwise. Survey © 1999 by investigator Larry Thomas of Marion, New York soybean formation discovered October 21, 1999.